Corporate services in Luxembourg: structure, flows & ownership. Creatrust helps corporates and institutional investors to structure their businesses and investments. We advise on how to setup the right vehicle for private equity deals, real estate projects, intellectual property management, co-investments and other corporate finance activities. Corporate structure: Creatrust advises on company structure, incorporation of the right vehicle to hold or acquire investments abroad and implements the central administration of this vehicle, including domiciliation, accounting, tax and legal services. Corporate flows: Creatrust advises on appropriate financing vehicles and the fiscal treatment of income flows. This includes issuance of bonds and securities, stock exchange listings and management of intellectual property, dividends, interests, royalties, merger-acquisitions, disinvestments and other income flows like stock options, derivatives, issuance of hybrid instruments to raise capital, etc. Corporate ownership: Creatrust advises on the organisation of ownership structure across a myriad of structures, including multiple stakeholders, partnerships, co-investment, management buy-outs, co-ownership, club deals, structuring the ownership structure, protecting assets and investment, and redomiciliation of companies. 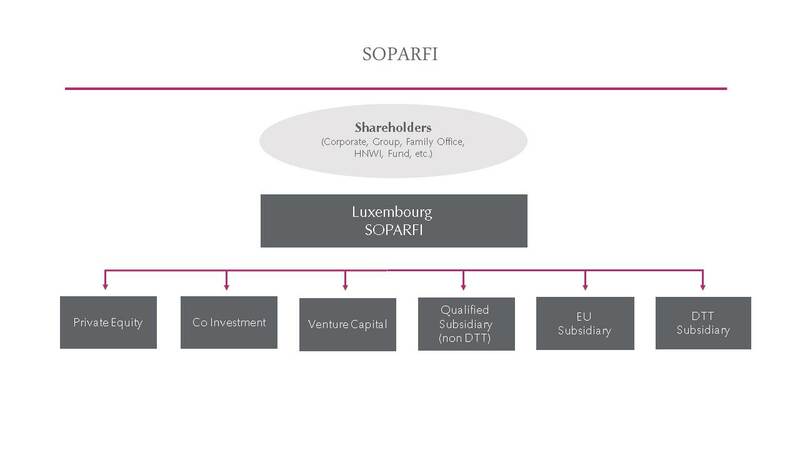 SOPARFI: In Luxembourg one of the most effective corporate structures is the ‘Holding Company’, whereby a company holds shares of local or international companies. A Luxembourg Holding Company can be an active or passive entity – it may run an active enterprise or be created primarily for financial reasons, such as issuance of debt or to raise capital and corporate finance. Real Estate SPV: Thanks to a large network of double tax treaties, the Real Estate Special Purpose Vehicle is the structure of choice to hold, maintain or transact on properties held in Luxembourg or abroad. Special Limited Partnership: This vehicle is fast becoming the entity of choice for investors including institutional investors, UHNWIs, club deals, co-investors, etc. It is flexible and structured to acquire, share, manage and dispose of al types of assets. It can also be setup as an Alternative Investment Fund. IP Company: The intellectual property management company helps authors, promoters, scientists and creators of wealth to incorporate a vehicle to build and manage their intellectual property rights. Private Wealth Management Company: UHNW individuals or Family Offices have been using these entities for decades to hold, manage, protect and transfer their assets, wealth and investments. SARL/SA/SE/SCA: These corporate entities can be used to setup a business in Luxembourg, invest in a start-up, venture, European Company or E-commerce business, or maintain a permanent establishment. Our Corporate team provides clients with a 360° view of their organisation and options, then implements, administers and manages the chosen solutions effectively. We offer comprehensive advice and central administration including domiciliation, accounting, corporate services, tax compliance, statutory audit, coordination, legal, and statutory reporting, payroll for executives.